Most online banking services provide a few different file export options so you can import your transactions into PocketSmith. We support a wide variety of bank files so you can bring over your transaction history regardless of where you bank! 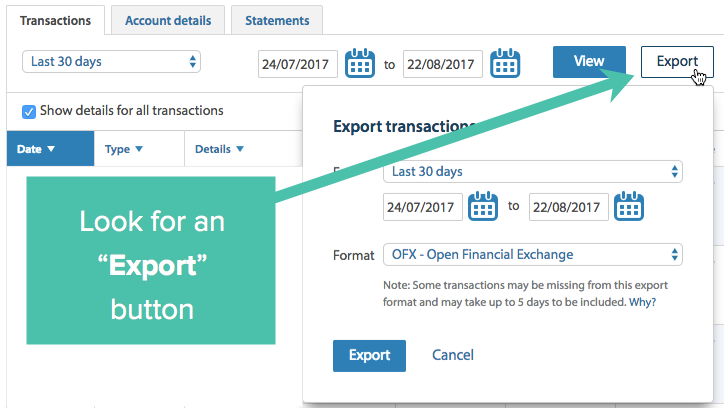 Before you can import your transactions into PocketSmith using bank files, you will need to export the files from your online banking website. To do this, log into your online banking and take a look at the export options. You will need to export files for each of the accounts you'd like to have in PocketSmith. Each online banking website will look different, however, most should provide an export option. 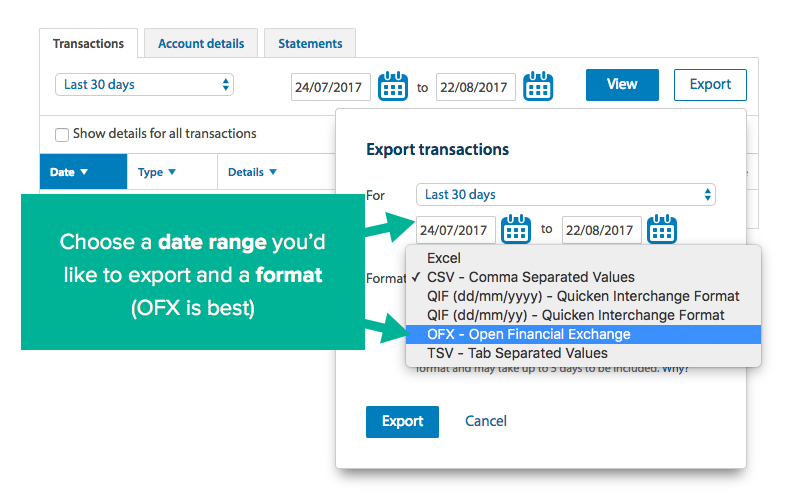 Once you have exported your bank files in one of the below formats, you are ready to import them straight into PocketSmith! Bank statements are different to bank files, PocketSmith will not accept a bank statement downloaded from your bank. See supported file types below. Four different file types that can be used to import transactions into PocketSmith. These file types are OFX, QFX, QIF, and CSV. OFX stands for Open Financial Exchange. OFX files follow a defined specification which means you do not need to provide PocketSmith with any additional information. We recommend using OFX files when possible. A QFX file is a standard OFX file. The only difference being that a QFX file is Intuit's version of the standard OFX format which is for Quicken. Typically QFX files are just as seamless as using OFX files. QIF stands for Quicken Interchange Format which is an older standard format, compared to OFX. A QIF file should be imported as easily as OFX and QFX. CSV stands for Comma-Separated Values and this file type stores tabular data in plain text. It is not a standardized format like OFX and QIF. Different banks provide CSV files that are in various layouts. You should only choose CSV files if OFX, QFX or QIF files are not available. It is not currently possible to import other file types into PocketSmith. For example, some banks only provide PDF files. We are not able to import bank statements or PDF files as this is a presentation format, so it is not possible to easily extract transaction data.